Many years ago, networks consisted of repeaters, bridges and router. Switches are the successors of the bridges. A switch is nothing else than a multiport bridge, and a traditional switch doesn’t know how to pass traffic to a different broadcast domains (VLANs). Passing traffic between different broadcast domains, is a job for a router. A router has an IP interface in each broadcast domain, and the IP interface is used by the clients in the broadcast domain as a gateway. A Switch Virtual Interface, or SVI, is exactly this: An virtual IP interface in a broadcast domain (or VLAN). It’s used by the connected clients in the broadcast domain to send traffic to other broadcast domains. This is how a SVI is created on HPE Comware 7. It’s similar to other vendors. At least one port is assigned to this VLAN, and as soon as at least one port of this VLAN is online, the SVI is also reachable. What happens, if you connect two switches with a cable? The broadcast domain spans both switches. Layer 2 traffic is transmitted between the switches. And what would happen if you connect a second cable between the same two switches? As long as you are running Spanning Tree Protocol (STP), or another loop detection mechanism, nothing would happen. But one of the two connection would be blocked. No traffic would be able to pass over this connection. If you want to use multiple, active connections between switches, you have to use Link Aggregation Groups (LAG), or things like Multiple Spanning Tree Protocol (MSTP) and Per VLAN Spanning Tree (PVST). Routers don’t know this. Multiple connections between the same two routers can’t form a loop. Loops and STP (an some other crappy layer 2 stuff) are legacies of the bridges, still alive in modern switches. Loops are a typical “bridge problem”. Some switches offer a way, to change the operation mode of a switch port. After changing this operation mode, a switch port doesn’t act like a bridge port anymore. It’s acting like the port of a router, that only handles layer 3 traffic. This is again a HPE Comware 7 example. I know that Cisco and Alcatel Lucent Enterprise also offer routed ports. This is a normal switch port. Please note the “port link-mode bridge”. To “convert” a switch into a routed port, simply change the link-mode of the port. As you can see, you can now assign an IP address directly to the port. Let’s try to make this clear with an example. C1-1 and C1-2 are two HPE Comware based switched, configured as an IRF stack (virtual chassis). These two switches form the core switch C1. S1 and S2 are two access switches, also HPE Comware based. Each access switch has two uplinks: One uplink to C1-1 and another uplink to C1-2, the two chassis that form C1. The 40 GbE Ports between C1-1 and C1-2 are used for IRF. Please ignore them. The uplinks between the switches, all ports are Gigabit Ethernet (GE) ports, are configured as routed ports. THe Link Layer Discovery Protocol (LLDP) traffic can pass the routed port. This is what the core switch (C1) “sees” over LLDP. Each routed port as an IP address assigned. The same applies to the routed ports on the access switches. Each uplink pair (core to access) uses a /30 subnet. As you can see, the interfaces working in bridge mode start counting at GE1/0/3. The same applies to STP. The ports, that were configured as routed ports, are not listed in the output. STP is not active on these ports. The example shows redundant links between access and core switches. There are no loops, but there’s also no layer 2 connectivity. VLANs are only located on the access switches. There are no VLANs spanning multiple switches. What does this mean? How can a client on S1 reach a server on S2? The answer is simple: You have to route the traffic on the access switches. But that’s a topic for another blog post. This entry was posted in Networking and tagged comware, hp, hpe, networking on September 9, 2016 by Patrick Terlisten. In March 2016, HPE CEO Meg Whitman announced a ProLiant-based HCI solution, that should be easier to use and cheaper than Nutanix. This isn’t HPEs first dance on this floor. In August 2015, HP launched the Hyper Converged 250 System (HC250), which is based on the Apollo server platform. The HW design of the HC250 comes close to a Nutanix Block, because the Apollo platform supports up to four nodes in 2U. Let me say this clear: The Hyper Converged 380 (HC380) is not a replacement for the HC250! And before the HC250, HPE offered the Converged System 200-HC StoreVirtual and 200-HC EVO:RAIL (different models). The HC380 is based on the ProLiant DL380 Gen9 platform. The DL380 Gen9 is one of the, if not the best selling x86 server on the market. Instead of developing everything from scratch, HPE build their new HC380 from different already available HPE products. With one exception: HPE OneView User Experience (UX). IT was developed from scratch and consolidates all management and monitoring tasks into a single console. The use of already available components was the reason for the low time-to-market (TTM) of the HC380. Currently, the HC380 can only run VMware vSphere (HPE CloudSystem uses VMware vSphere). Support for Microsoft Hyper-V and Citrix XenServer will be added later. If you wish to run Microsoft Hyper-V, check the HC250 or wait until it’s supported with the HC380. All three use cases are orderable using a single SKU and include two DL380 Gen9 nodes (2U). You can add up to 14 expansion nodes, so that you can have up to 16 dual-socket DL380 Gen9. Each node comes with two Intel Xeon E5 CPUs. The exact CPU model has to be selected before ordering. The same applies to the memory (128 GB or 256 GB per node, up to 1,5 TB) and disk groups (up to three disk groups, each with 4,5 to 8 TB usable capacity per block, 8 drives either SSD/ HDD or all HDD with a maximum of 25 TB usable per node). The memory and disk group configuration depends on the specific use case (virtualization, CloudSystem, VDI). The same applies to the number of network ports (something between 8x 1 GbE and 6x 10 GbE plus 4x 1 GbE). For VDI, customers can add NVIDIA GRID K1, GRID K2 or Telsa M60 cards. NOTE: HPE Hyper Converged 380 for VMware vSphere requires valid VMware vSphere Enterprise or higher, and vCenter licenses. VMware licenses can only be removed from the order if it is confirmed that the end-customer has a valid licenses in place (Enterprise License Agreement (ELA), vCloud Air Partner or unused Enterprise Purchasing Program tokens). Hewlett Packard Enterprise supports VMware vSphere Enterprise, vSphere Enterprise Plus and Horizon on the HPE Hyper Converged 380. 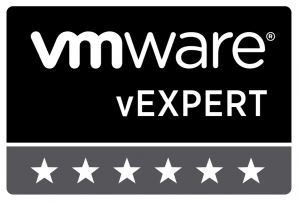 No support for vSphere Standard or Essentials (Plus)! Let’s see how HPE will react on the fact, that VMware will phase out vSphere Enterprise licenses. The server includes 3y/ 3y/ 3y onsite support with next business day response. Nevertheless, at least 3-year HPE Hyper Converged 380 solution support is requires according to the latest QuickSpecs. 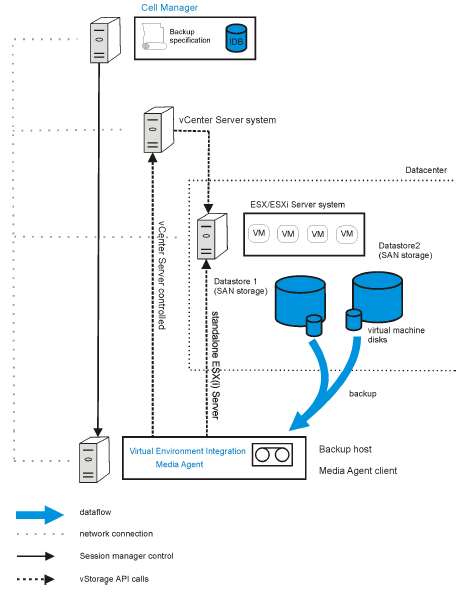 The Management VM is used for VMware vCenter (local install) and HPE OneView for vCenter. You can use a remote vCenter (or a vCenter Server Appliance), but you have to make sure that the remote vCenter has HPE Oneview for vCenter integrated. The OneView VM running HPE OneView for for HW/ SW management. 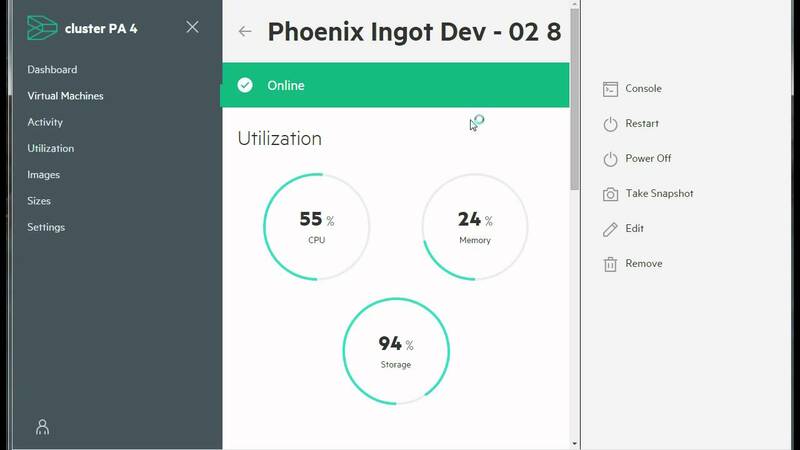 The Management UI VM is running HPE OneView User Experience. The shared storage is provided by HPE StoreVirtual VSA. A VSA is running on each node. As you might know, StoreVirtual VSA comes with an all-inclusive license. No need to buy additional licenses. You can have it all: Snapshots, Remote Copy, Clustering, Thin Provisioning, Tiering etc. 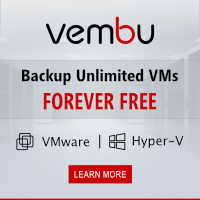 The StoreVirtual VSA delivers sustainable performance, a good VMware vSphere integration and added value, for example support for Veeam Storage Snapshots. When dealing with a 2-node cluster, the 25 TB usable capacity per node means in fact 25 TB usable for the whole 2-node cluster. This is because of the Network RAID 1 between the two StoreVirtual VSA. The data is mirrored between the VSAs. When adding more nodes, the data is striped accross the nodes in the cluster (Network RAID 10+2). You have to meet some requirements before you can start. 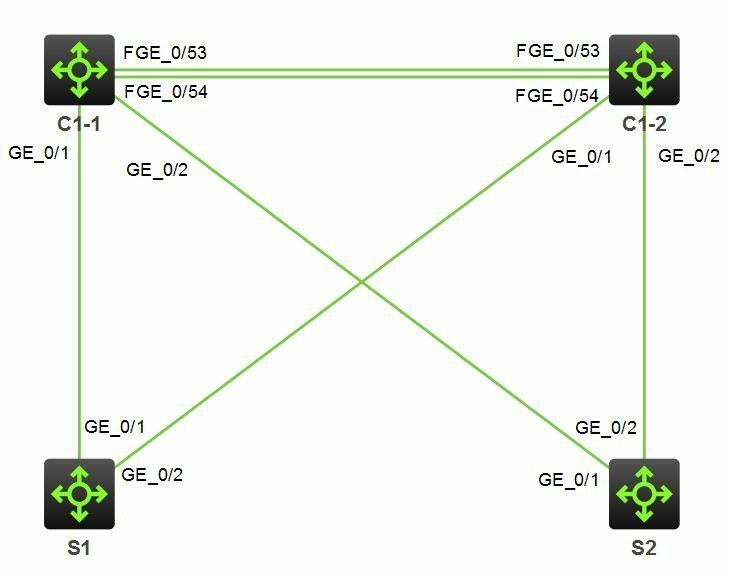 You should leave space for expansion nodes. A proper planning saves you later trouble. 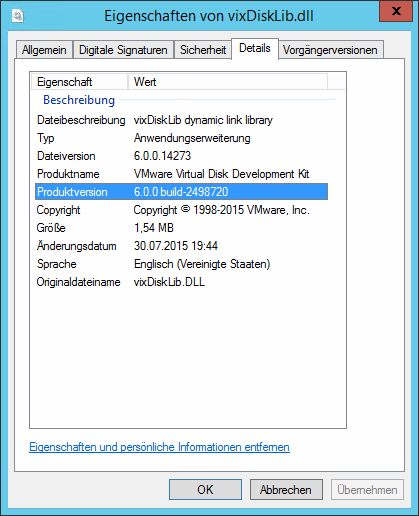 After the deployment, you have to install the StoreVirtual VSA licenses. Then you can create datastores and, finally, VMs. Hyper-Converged has nothing to do with the form factor. Despite the fact that a 2-node cluster comes in 4U, the HC380 has everything you would expect from a HCIA. The customers will decide if HPE held promise. The argument for the HC380 shouldn’t be the lower price compared to Nutanix or other HCI players. Especially, HPE should not repeat the mistake of the HC200 EVO:RAIL: To buggy and to expensive. The HC380 combines known and mature products (ProLiant DL380 Gen9, StoreVirtual VSA, OneView). It’s now up to HPE. I have several small and mid-sized customers that are running two to six nodes VMware vSphere environments. Also the HC380 for VDI can be very interesting. This entry was posted in Server and tagged hci, hp, hpe, hyperconverged, proliant, server, vmware, vsphere on May 18, 2016 by Patrick Terlisten.